Discuss the top new features for platform developers. Maintain your Salesforce Certified Platform Developer I certification. Hey Trailblazer, if you hold the Salesforce Certified Platform Developer I credential, keep in mind that you need to complete this module by December 14, 2018, to maintain your certification. Check out the deadlines here. Interested in learning more about getting certified? Check out the Salesforce Certified Platform Developer I credential. You can control whether a page is styled with the look of Lightning Experience when viewed in Lightning Experience or the Salesforce app with the lightningStylesheets attribute. Here is a standard Visualforce page without the lightningStylesheets attribute. The page is styled with the Classic UI. Here is the same Visualforce page with the lightningStylesheets attribute set to true. You can style most commonly used Visualforce components with the lightningStylesheets attribute. However, some components differ slightly in style from Lightning Experience. For example, <apex:selectOptions>, <apex:selectRadio>, <apex:inputFile>, and some <apex:inputField> elements use the browser’s default styling instead. Commonly used Visualforce components that don’t require styling, such as <apex:form>, <apex:outputText>, and <apex:param>, are still supported. To include SLDS components that aren’t part of the Visualforce component library, you can use the <apex:slds /> tag with custom SLDS code in addition to the lightningStylesheets attribute. The lightningStylesheets attribute doesn’t affect custom styling, so custom code must be updated to match the page’s SLDS styling. The list of Visualforce components detailed here support the lightningStylesheets attribute or don’t require styling. Use these variables to identify the CSS used to render Salesforce web pages to a user. To learn more about rendering different layouts based on a user’s theme click here. Scrambles users’ data on their request when they no longer want their personal data recognized in Salesforce. When you invoke the method for the user, the data becomes anonymous, and you can never recover it. Use the username method to set the username to a specific value after it’s scrambled. Registers an identity verification method. Verification methods include a time-based one-time password, email or text one-time password, Salesforce Authenticator, or Universal Second Factor (U2F). End users register their verification methods. New Apex methods help you get the developer name for record types more easily. Previously, the developer name was accessible only via SOQL on the RecordType SObject, and not via describe information. Now you can use the following methods to get the developer name. Flows can do lots of powerful things, and those things often count toward your per-transaction limits. Now you can use debug logs to identify which flow elements contribute the most against those limits. These details help you troubleshoot errors and monitor usage as you activate and distribute your flows. You can also use these details while testing flows that you’re building to prevent them from reaching governor limits at run time. Access debug logs from the Logs tab in the Developer Console. Or from Setup, enter Debug Logs in the Quick Find box. In the level, set Workflow to Finer. Use these debug event types to monitor flow usage against per-transaction governor limits. FLOW_START_INTERVIEW_LIMIT_USAGE—Includes the number used by the transaction upon starting the flow interview but before executing flow elements. Also includes the per-transaction limit. FLOW_ELEMENT_LIMIT_USAGE—Includes the number used by the flow element, the total count used by the transaction after executing the element, and the per-transaction limit. FLOW_BULK_ELEMENT_LIMIT_USAGE—Includes the number used by the element executed in bulk, the total count used by the transaction after executing the element, and the per-transaction limit. With custom metadata type records available to reference in validation rules, you don't need to hard code values. Reference the records directly within the validation rules to avoid adding the same values to each rule. The ability to reference custom metadata type records helps subscriber orgs, too. Previously, when you added a validation rule to a managed package, a subscriber could not edit it. Now you can define the logic and leave customization to a subscriber. Consider a validation rule that limits the discount on a brand to 10%. You decide to change the discount, so the validation rules that use this value need updating. Rather than update multiple rules that check the discount amount, reference a custom metadata record within the validation rules. 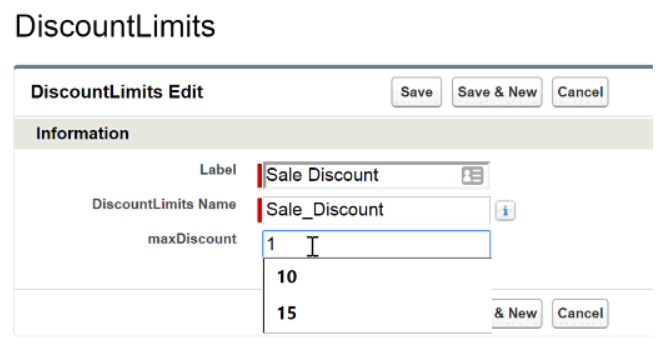 Then, you can update the discount amount in the custom metadata record without modifying the validation rule. It’s official! There’s a new URL format in town. When setting up pointers to areas in your Salesforce org, you can now take advantage of our shorter, easier-to-understand URLs. The new URL format is more readable, addressing the issue of being directed to an unexpected location when accessing Lightning Experience URLs before authenticating. If you have query string parameters appended to /one/one.app such as /one/one.app?myparam1=xyz&amp;myparam2=abc, they’re rewritten as /lightning?0.myparam1=xyz&amp;0.myparam2=abc.